Wherever you go in the world it remains a fact that learning to dive isn't cheap. For those of us living in the northern parts of Europe it can also a chilly experience as even in the spring and summer the water is... let's say refreshing, although you can of course wear a dry suit which helps to keep you warm. However, it's also fair to say that the aquatic life lacks the colour and diversity you will find at some of the more popular holiday destinations. However, the cost of the course can be more than just the euros you hand over to the dive centre. A typical Open Water course will take four days of your holiday. The first two days will consist of theory lessons in the classroom and so called "confined water" dives, usually in a swimming pool. These are then followed by two days of diving in the sea (open water). So here is the question: Why waste valuable time on holiday learning theory and being in a swimming pool when you can easily do that at home? You can then take proof of your learning to any PADI dive centre worldwide to carry out the open water dives in warmer water with far more interesting aquatic life - the best of both worlds! So here is my simple value proposition: I will teach you the theory you need and prepare you with the basic skills by carrying out what is effectively the first half of your PADI Open Water diver course. 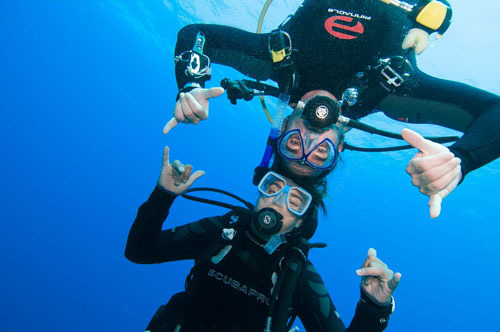 You can then go on your holidays (anytime within the following 12 months) and complete your course and achieve the PADI Open Water diver qualification. We will do the course according to your schedule for example after work in the evening, or at weekends - whenever fits for you. Theory lessons can be completed in your own home making even more convenient. It really is that simple!